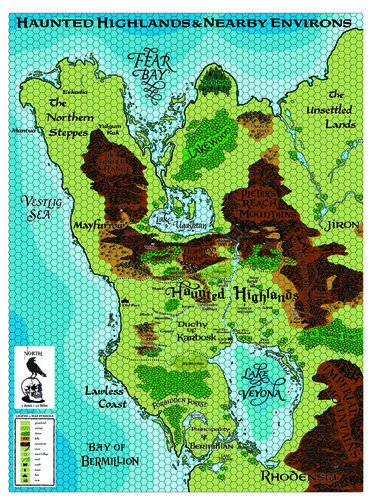 Darlene is best known in the gaming industry for creating the classic world of Greyhawk map for TSR. It's become a iconic map known the world over. Her distinctive style of cartography is both graceful and alluring. Her font choices render the world both playable and exciting. It is classic material by one of the greatest cartographers in the industry. Here, Darlene has rendered the Haunted Highlands in her classic style, bringing it to life like no one else can. This full sized poster map is 18 inches by 22 inches and printed on stout glossy paper.